What a nightmare if you live in Israel. Walking down the street, you never know if you’re going to be stabbed. You never know what the UN will do against you next. And you never know what President Obama and the State Department will do to weaken your security, peace and freedom. The tragedy for Israel is profound. Tourists are canceling going to Israel. My wife and I are postponing our next trip, and we’re only one of millions. The issues are so complex. But from a Biblical perspective, Israel’s struggle goes back to Satan’s plan to destroy the Jews. The evil – and no one seems to want to call it evil in U.S. government – is that the terrorism now taking place throughout Israel is a reflection of growing anti-Semitism worldwide and, on the U.S.’ part, moral relativism. Anti-Semitism is rampant, as even young kids in school are taught to hate the Jews and view them as sub-human. They are taught that they have been oppressed and must fight. The mosques, the parents, the schools, the TV and radio, and the government leadership of the Palestinians are promoting this reign of terror. Their schools and Islamic faith teach that if you die while killing a Jew, you are a martyr. They have military training camps for children during summer breaks, and their social media is filled with hate. The truth is covered up, and stories are twisted to promote lies and hate. And the U.S. is giving our taxpayer money to the Palestinian security forces that endanger Israel. 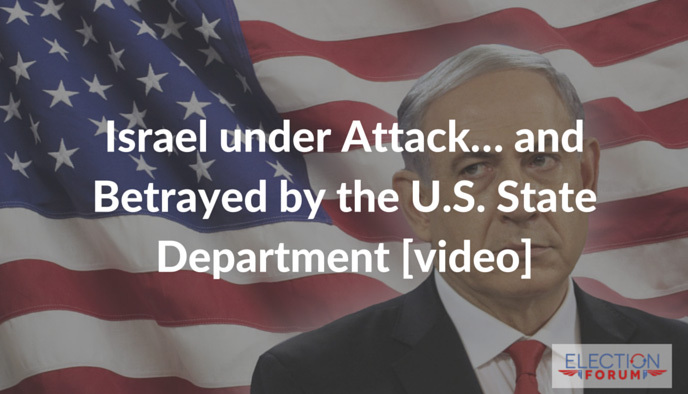 The U.S. State Department refuses to condemn the Palestinian acts of terror. Instead, they ask that the Palestinians and Israelis talk, compromise, and negotiate. There’s no moral outrage; there’s no right or wrong; there’s no definitive call to stop the attack on innocent women, children and men. It’s a reflection of the moral relativism and anti-Israel attitude on the part of the United States. Pray that the U.S. will come to the defense of Israel.